The Georgian Idol finalists have made their song choice! As reported earlier, the final of Sakartvelos Varksvlavi (Georgian Idol) will, at the same time, serve as the national final for the Eurovision Song Contest! Four contestants are still in the race: Giorgi Nakashidze, Giorgi Pruidze, Liza Kalandadze and Oto Nemsadze. These candidates have all chosen a song, written by Levan Basharuli, Roma Giorgadze and Tamar Babilua. You can read a bit more about these songwriters’ backgrounds here. 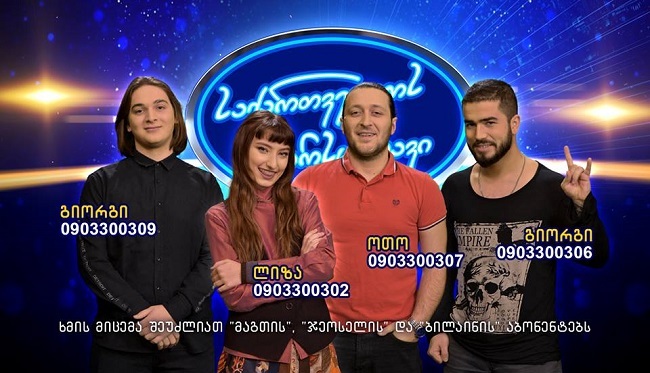 All songs are in the Georgian language, three songs in total so two candidates have chosen the same song: Giorgi Nakashidze and Oto Nemsadze will both be singing ‘Sul tsin iare’. Watch the trailer for the final here below! The Grand Final of Georgian Idol will be held this Saturday, starting at 19:00 CET, where the televoters will have a 100% say in which song and artist will represent them at the Eurovision Song Contest in Tel Aviv this year! These are YOUR qualifiers in the first semi final of Beovizija 2019! Who should win each of the Melodifestivalen 2019 Andra Chansen duels?